I've not posted much, because I'm at the NRA annual meeting in Indianapolis. Yesterday I attended the Moms Demand Action "protest." It was actually staged about 3/4 mile away from the convention (probably because they didn't want their handful to be seen against a backdrop of tens of thousands of NRA members going into the convention hall(, When I set up a videocam, one of their members stood in front of it, blocking the view, I assume to ensure that only trusted mass media could get footage. Given how pitifully few showed up, that was understable. 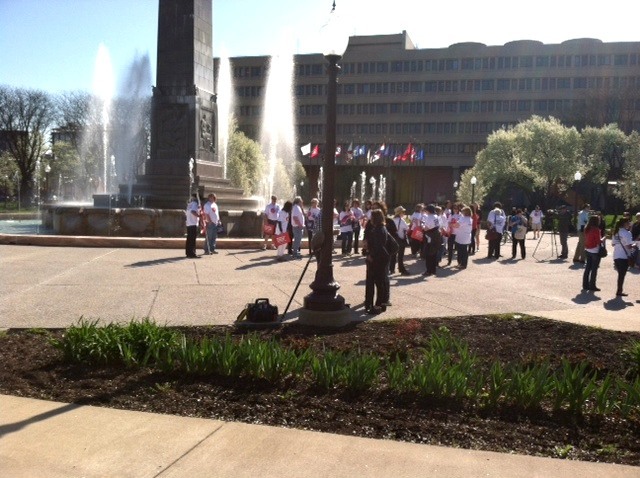 In the cell phone image below, the dozen or so people in white T-shirts are the protestors. UPDATE: Moms Demand Action claims that "More than 100 Moms Demand Action members from around the country on the ground in Indianapolis this weekend...." Not even close. Dave, their presumptively armed security made an appearance in Ga during the No More Names tour at our capitol. Two of their security are the same guys that we had here. Question for you. Do you know if LEOSA covers an officer's paid work as armed security across state lines? If not I'm starting to wonder how these guys go armed from state to state legally and work as security. Apparently they are not sharp enough to realize that even if it was 300, its still pathetic. They may be able to legally carry for their personal protection, but to work in executive protection (unless that is their assignment from their home agency and they're protecting a designated person), they must be licensed as a private investigator in Georgia, which has it's own firearm qualification standards. Can you both contact me at reedrob1 at hotmail.com ? I just want to start by checking into what you each said a little and dig from there. Slight correction - they have to work for a security company licensed in Georgia and be registered as an employee of that company, but law enforcement officers do not require a Board-issued carry license (commonly known as an "armed guard card" or "blue card"). I used to work as an armed security officer in Georgia, back in the bad old days when the only authorized weapon for a uniformed guard was a .38 revolver with a 4" barrel... Licensed private detectives (which is the category required to work executive protection) could carry semiautos, but back then, nothing heavier than 9mm.